In some cases, a businessperson can find it convenient to use this form to have someone else conduct financial transactions for him or her. For example, if you have to sign orders to buy products for your business on a routine basis, you can enable someone to do this for you. Without the power of attorney, the vendor might not allow someone else to buy property in your name. You can also enable someone to withdraw cash from your accounts, or buy and sell stock in your name. Thus, it’s very important to pick someone you have complete trust in as he or she will have the responsibilities even if you should not be able to think rationally for yourself. 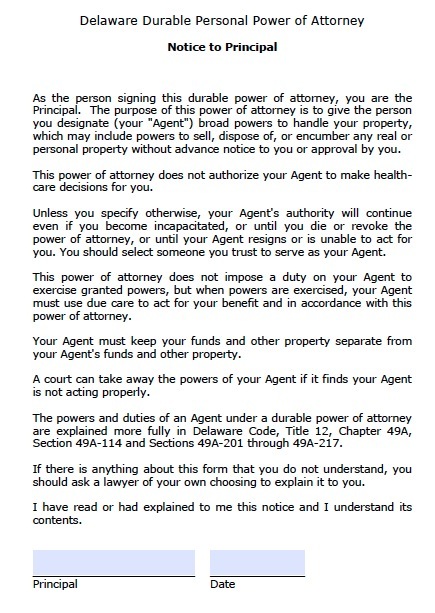 To execute a power of attorney in Delaware, you have to sign the document in the presence of two witnesses, or a notary public, and they must state in writing that they are not prohibited witnesses.